Our Thought Leadership Series on Real Vision is Coming Soon – See our Latest – Debt Jubilee here. 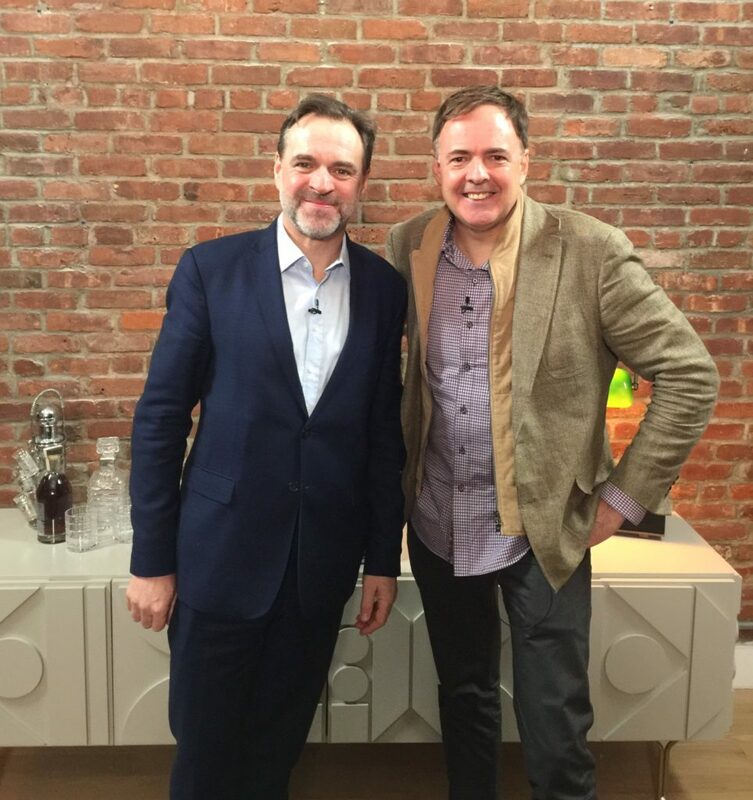 Our Larry McDonald with hall of fame historian Niall Ferguson in Manhattan Friday. 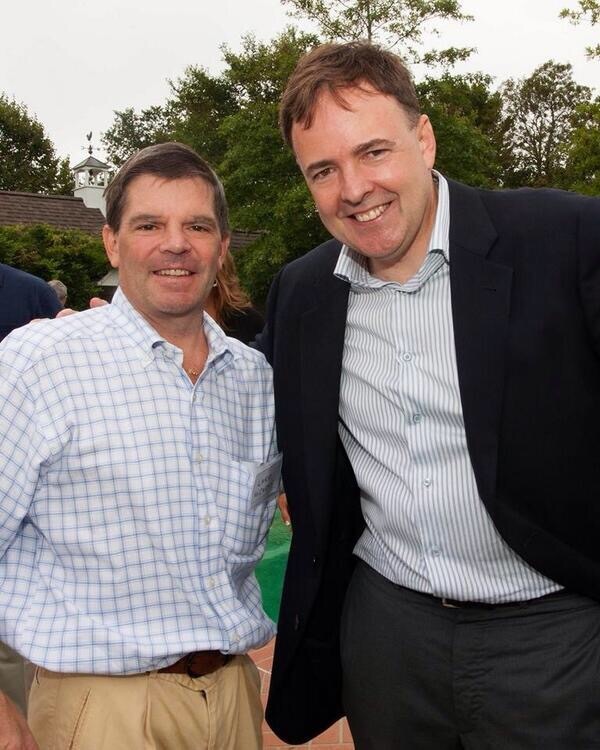 The Debt Jubilee, see our latest sit down on Real Vision here . We often tell clients, “credit leads equities.” Even more important, tightening financial conditions (FCIs) drive Federal Reserve policy movements, NOT lagging economic data. Nearly every economist in the U.S. was calling for 2-3 rate hikes back in October / November – even as financial conditions were tightening at the fastest pace since 2015. 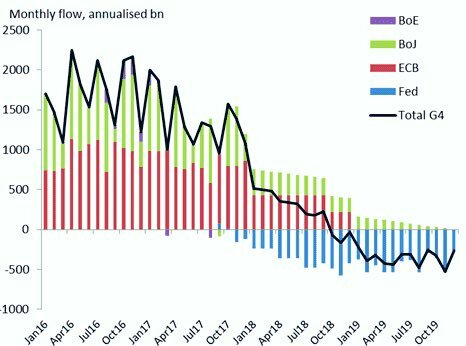 By focusing on FCIs, in late Q3 2018, we were able to position clients in a basket of “Fed Pause” trades (emerging markets, energy, gold) – this thesis has played out beautifully. It’s interesting to note just how much financial conditions have eased since the Fed’s hall of fame cave. This speaks to creeping reflation risk, a rate hike probability revival. Gold has been singing this tune over the last week. The very latest reading of the core PCE index, rose 0.19%, its largest monthly gain since May. Prices for services, more sensitive than goods to domestic labor supply / wages, surged 0.29% – the largest jump in nearly 15 months. It’s also interesting to note how much bonds have rallied with sharply lower yields in U.S. Treasuries, while core PCE inflation is still up meaningfully over the last 18 months and NOT giving up any ground (see the white circle above). Just when the Street gave up on reflation and the rate cut camp started to overflow – bonds put in the most significant sell-off since Q2 2018 in recent days. It’s looking more and more like China hit the panic button heading into the trade negotiations. They were dealing from a position of weakness with an economy reeling from the sharpest global slowdown in decades. The mountain of fiscal and monetary policy actions they’ve taken is nothing short of remarkable. RRR cuts, tax cuts, infrastructure spending splurge. 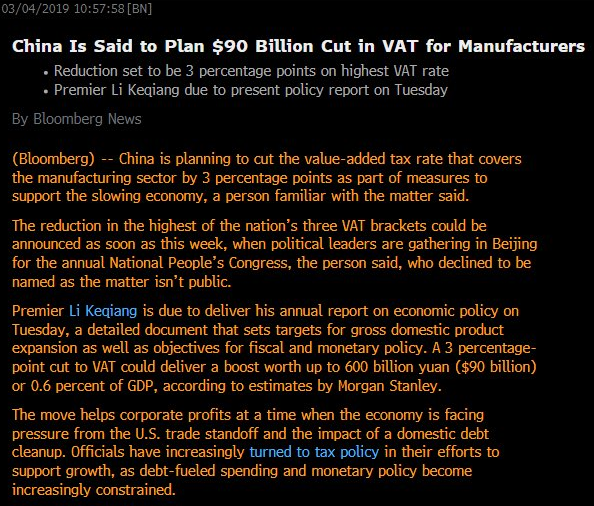 Looks like an $800B boost to the German economy 🙂 – maybe global synchronized growth will appear on stage after all? Economic boost: This will help Xi’s team sitting across the table from Uncle Bob (U.S. trade hawk) Lighthizer. We must track true credit conditions, credit availability – follow the leading indicators. The CDX IG is the most followed measure of corporate credit conditions in the U.S., we’re looking at the credit spreads on large investment grade companies above. As you can see, credit conditions tightened dramatically, and then the senior loan officer survey caught up with what the CDX IG was telling us weeks earlier. 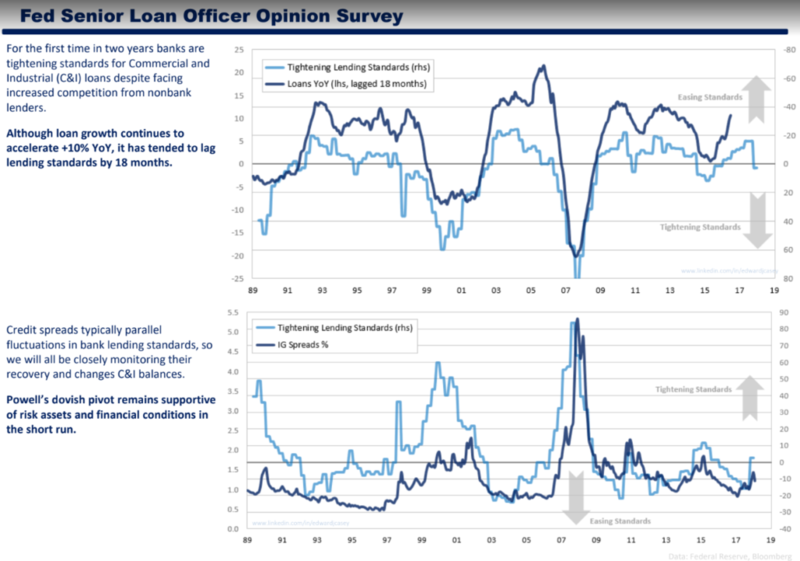 The Fed pays close attention to the loan survey data above, unfortunately, it takes forever to compile the STALE data. The survey above is the most recently available, as of January 31, 2019, but the actual engagement with loans officers was compiled in Q4. The white line above is telling you current credit conditions are easing, and easing fast relative to the now “out of date” C&I loan survey data. Our associate Ed Casey points out, the first time in two years, banks were tightening standards for Commercial and Industrial (C&I) loans in Q4 despite facing increased competition from nonbank lenders. Although loan growth continues to accelerate +10% YoY, it has tended to lag lending standards by 18 months. Corporate credit spreads typically lead bank lending standards, so we will all be closely monitoring their recovery and changes C&I balances. Fed chair Powell’s cave-athon – or dovish pivot – remains supportive of risk assets and financial conditions in the short run. Pick up our latest report here. In the hole, December 2018, see our high conviction “get long equities” call here. 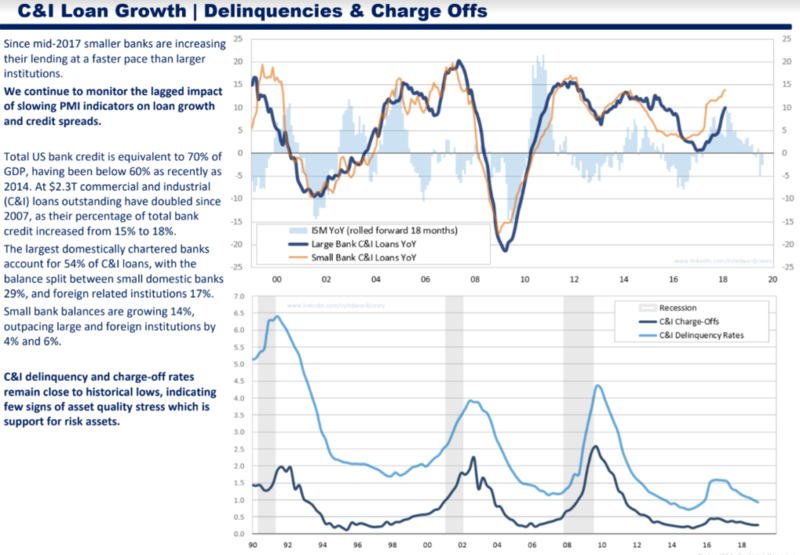 C&I delinquency and charge-off rates remain close to historical lows, indicating few signs of asset quality stress which is support for risk assets. Our Ed Casey notes, total US bank credit is equivalent to 70% of GDP, but below 60% as recently as 2014. At $2.3T commercial and industrial (C&I) loans outstanding have doubled since 2007, as their percentage of total bank credit, increased from 15% to 18%. Since mid-2017 smaller banks are increasing their lending at a faster pace than larger institutions. We continue to monitor the lagged impact of slowing PMI indicators on loan growth and credit spreads. Pick up our latest report here. Here’s a look at the S&P 500 and Fed Chair Powell’s posture on global financial conditions. 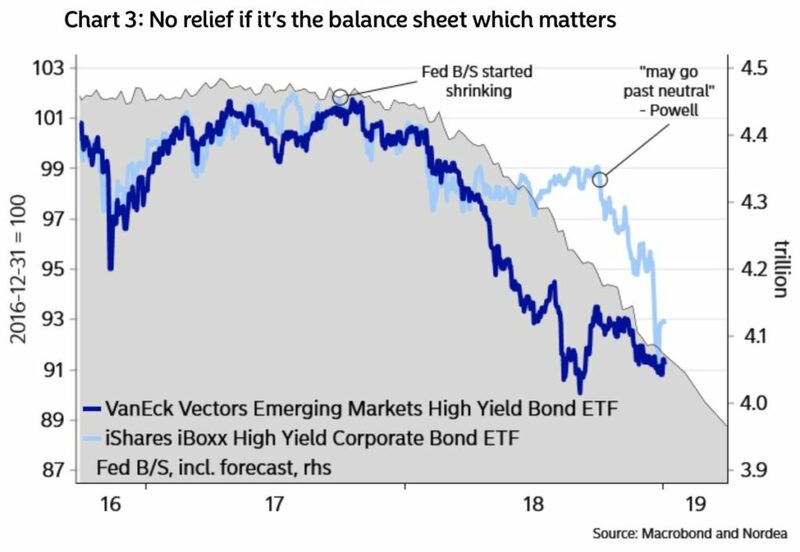 With a splash of hubris, we’ve been lectured for nine months that the Fed is going to “stay in our lanes, the U.S. economy.” The latest shift from “Not Concerned” to “Concerned” has global equities moving higher. Since 2010, through all their denials, ultimately global financial conditions (FCIs) have been driving the Fed policy path NOT U.S. economic data, the Fed made a colossal shift this week. Economic data in recent weeks is sending a message loud and clear. Regional Federal Reserve Bank Factory output readings and global PMIs are making the recent equity and credit market volatility look HIGHLY credible in forecasting future tangible economic weakness. As a result, with a fire hose in hand, Fed Chair Powell spoke this week alongside Janet Yellen and Ben Bernanke where we witnessed a further dovish shift from the Fed Chair. Markets ripped higher in response to the Powell cave-in (capitulation from his Q4 2018 policy path stance). The re-pricing of Fed probabilities in the past four weeks has been on a historic run, from pricing 83% probability of a Fed “tightening” in 2019 to 30% probability of “an ease” has had a dramatic impact on Eurodollar spreads, stock and bond prices and of course interest rates. Let us review. The Richmond Fed manufacturing survey for December came in exceptionally weak; -8 vs +15 expected. This is the lowest level since June 2016. This is yet another data point showing economic momentum in the U.S. slowing down, which will eventually be helpful in pushing the Fed to back off on rate hikes. The Markit Manufacturing PMI print came in slightly below expectations on Wednesday, however, the ISM Manufacturing PMI released Thursday morning was a massive miss. Working with our associates at Astor Ridge, we expected the ISM PMI to come in well below expectations and calculated it could be as low as 54.0. Regional PMIs had seen substantial misses in the past two weeks and though the market was pricing in a significant drop from 59.3 to 57.5, it seemed to be overlooking the surprisingly poor regional data prints. Above are listed the Dallas, Philadelphia, New York, Richmond, and Kansas City Factory gauges, the dotted line is too close for comfort, recession territory. One thing driving the Federal Reserve and the bond market crazy is the whacky disconnect between U.S. wages (AHE in white above) and the global economy’s downward pressure on bond yields (see the U.S. 10 year yield in yellow above). Bonds are in rally mode with lower yields in part because of a large supply of workers, U.S. labor force slack. There are far too many young people NOT in the labor force to generate sustainable inflation. Friday, the unemployment rate rose to 3.9% from 3.7% because the labor force increased by 419k. That’s real size slack* coming back into the labor force. Per OECD data, the U.S. labor force of 25-54-year-olds is down one million (80m to 79m) workers over the last decade, but the U.S. population is 26m larger. A colossal impact on the bond market is baked inside this data. Pick up our latest report here. *This does confirm a long-held belief that the U.S. economy during the 2008-2016 period of economic “secular stagnation” pushed far too many (young) eligible workers off to the sidelines. As such, the available (real world) labor “slack” remains much more plentiful than the headline unemployment rate reflects. (We believe Fed Chair Powell has commenced using this slack to justify a softer policy path). Note in December, the labor force participation rate rose above 63.1% for the first time since 2013! Bottom line, look at the whole picture, NOT the unemployment rate when trading gold, bonds, and interest rate sensitive equities. Powell’s cave-in comes after the another Regional Fed president capitulated Thursday morning in a Bloomberg Television interview. Kaplan’s comments were especially important NOT because of the content, but because of his substantial shift in tone since just last October. Dallas Fed President Robert Kaplan, October 19, 2018. The combination of rate hikes and balance sheet reductions from the Federal Reserve in 2018 sucked up global U.S. dollar liquidity and put emerging markets under immense pressure. Next, the collateral damage forged onto the global economy took U.S. stocks lower in Q4. In our view, so far the Fed’s $400B balance sheet reduction vacuumed $1T out of the banking system. Through 2018, foreign banks – size holders of excess reserves – have been forced to search for other funding sources. 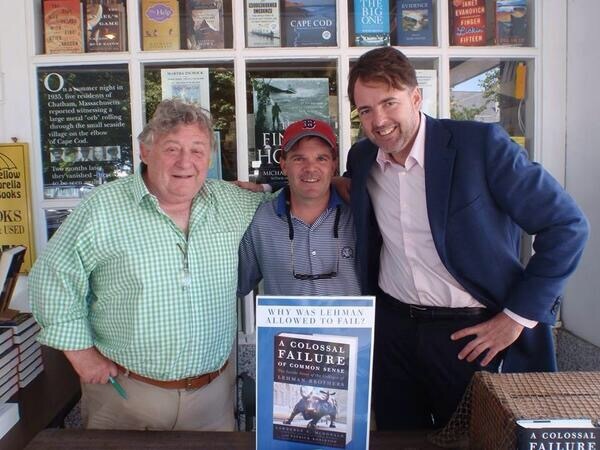 The unintended consequences here are all over the floor. Globally, borrowing costs for consumers have surged with short term money market yields. The economic destruction is far more than meets the eye, the Fed is clearly walking in the dark here and they can’t find the light switch. Emerging market equities were 20-30% lower from February through October, bonds (credit markets) didn’t fare much better (see above), next the S&P played catch up to the downside. This, combined with tariffs from the White House has placed global manufacturing in a significant slowdown that has begun to circle back into the United States. After all, over $60T of global GDP is OUTSIDE the USA. All-time highs in U.S. equities just so happen to be perfectly timed with global central bank candy (asset purchases) fleeting into negative territory. Offshore dollar debts worldwide have ballooned to $12.8T (BIS data). Roughly $4T of contracts outside the US are priced off three-month Libor rates alone, which have doubled over the last year. Rate hikes matter, the Fed balance sheet reduction matters more, pure global economic impact. Loretta Mester is considered one of the most hawkish Fed governors. It’s very important to watch for shifts from the extreme wings inside the Fed. When a hawk shifts to a more dovish posture, it means far more than a Fed dove repeating a long-held view. *Fed “hawks” favor less market/economy accommodation (further rate hikes, Fed balance sheet reduction). Fed “doves” favor more accommodation (fewer rate hikes, possible hold period or rate cuts; less Fed balance sheet runoff). Cleveland Federal Reserve Bank President Loretta Mester said in an interview with Reuters this week. (Our Larry McDonald had dinner with Loretta Mester in October, spoke to her personally, “one-on-one” for 15 minutes, this is a far different perspective from her in our view, with a meaningful impact on markets). The market is giving the Fed the “Rodney Dangerfield, “No Respect.” The Fed’s ability to hike rates further in 2019 is in doubt above. Not only are U.S. 2 year yields BELOW the upper bound of the Fed Funds rate, but this week futures were pricing in a higher probability of a rate cut than a rate hike in 2019. There are a number of ways to bet against Fed rate hikes, most efficient is trading EuroDollar futures. One of our best trade ideas issued to clients in the fourth quarter of 2018 was buying Gold and Silver miners. In our view, precious metals are powerful tools to take advantage of a Fed that has been too hawkish. Since October 1st, the probability of ANY Federal Reserve hike has completely caved. Meanwhile, since August, the GDX gold miners ETF is up +23.1% while the SIL Silver Miners ETF is +15.2% higher with the S&P 500 off nearly 15%. Pick up our latest report here.